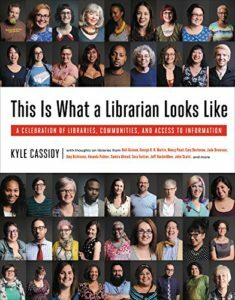 Photojournalist (or “artist who sometimes uses a camera”) Kyle Cassidy returns to talk about his new book, This Is What a Librarian Looks Like ! Along the way, we also talk about photography, his love letter to America, the difference between knowledge and information, the heroism of NASA scientists, the example of Mr. Rogers, his continued use of LiveJournal, the joy of running, his love letter to America, and how he convinced his wife that they should take vacations to visit libraries. Also, his cat Roswell gets his two cents in! Give it a listen! And go buy This Is What a Librarian Looks Like: A Celebration of Libraries, Communities, and Access to Information ! Kyle Cassidy has been documenting American culture for more than two decades. He has photographed Goths, Punks, Cutters, Politicians, Metalheads, Dominatrices, Scholars, and Alternative Fashion, in addition to less prosaic subjects. In recent years his projects have extended abroad to Romania, where he captured the lives of homeless orphans living in sewers; and to Egypt, where he reported on contemporary archaeological excavations. His publications include several books on information technology, as well as a regular appearance as contributing editor for Videomaker magazine. His Photo-A-Week blog was one of the first photo blogs on the internet. His work has appeared in The New York Times, Barron’s Financial, Photographers Forum, Asleep by Dawn, Gothic Beauty and numerous other publications. Credits: This episode’s music is Nothing’s Gonna Bring Me Down by David Baerwald, used with permission from the artist. The conversation was recorded at Kyle’s home on a pair of Blue enCORE 200 Microphones feeding into a Zoom H5 digital recorder. I recorded the intro and outro on a Heil PR-40 Dynamic Studio Recording Microphone feeding into a Cloudlifter CL-1 and a Mackie Onyx Blackjack 2×2 USB Recording Interface . All processing and editing done in Adobe Audition CC . Photo of Kyle & Roswell by me. It’s on my instagram.